Modbury Parish Council warmly welcomes you to its website. Whether you are a resident of the parish, a tourist or prospective tourist or indeed merely “surfing the net” we hope that you will find the website both helpful and interesting. Modbury is a small historic town of 1,700 people. It can be found about 12 miles to the east of Plymouth and about 5 miles from the beautiful South Devon coast. 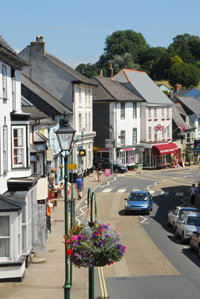 Modbury is the local centre for the surrounding villages and has an excellent range of shops and services. Modbury is a small historic town of just under 2,000 people. It can be found about 10 miles to the east of Plymouth and about 5 miles from the beautiful South Devon coast. Modbury is the local centre for the surrounding villages and has an excellent range of shops and services. Hours: Tuesdays 2pm - 4pm and Saturdays 10am – 11am (closed on Bank holidays) .